Hot lamination for 3-mil or 5-mil and cold setting for self-adhesive pouches. Green light and audible beep indicate when machine is ready to laminate. Release lever disengages pouch for re-centering or removal. Auto Shut off save energy and prevents overheating. Simply feed any pouch to easily preserve and enhance the appearance of your office documents, school projects, and presentations. 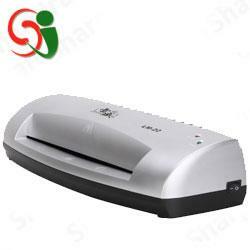 This laminating machine comes with ten 3-mil letter pouches, giving you everything you need to get started.